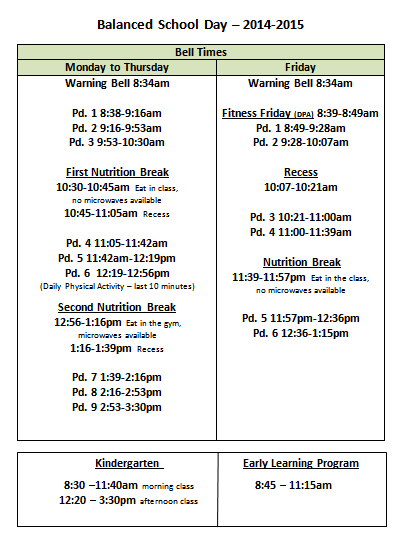 Last year, in an attempt to improve student learning, we decided to do a pilot of the Balanced School Day approach. Although it is still very much debatable, the majority of people I talk to believe it has been a positive experience. A big reason for trying the Balanced School Day was to improve student learning, this too is debatable. Some of our division one teachers found the day seemed to be longer and students were more off task near the end of the day. All of our division two teachers provided different feedback, they all found students to be a lot more focused at the end of the day. Our division two teachers are purposely scheduling academic subjects at the end of the day. On a related note, we have seen less discipline issues due to recess breaks, simply since we have two breaks compared to three breaks. Parents – 1st priority was ‘Focus on literacy’ with 64 ‘stars’. The Balanced School Day was the 5th priority with 37 ‘stars’ and the Traditional School Day was the 12th priority with 22 ‘stars’. Staff – 1st priority was ‘Focus on numeracy’ with 30 ‘stars’. The Balanced School Day was the 7th priority with 8 ‘stars’ and the Traditional School Day was the 5th priority with 12 ‘stars’. 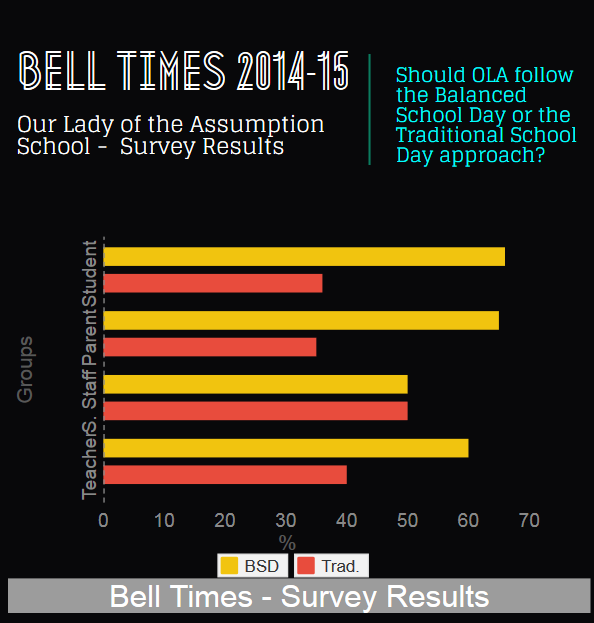 The majority of our students and parents prefer the Balanced School Day approach. Our support staff is split on the issue of the Balanced School Day and the Traditional School Day. The majority of our teachers support the Balanced School Day approach. This support is greater in division two, compared to division one. Thank you very much to everyone that participated in our community input process. I appreciate your thoughts and I am very impressed with the passion in improving Our Lady of the Assumption School.